Not to be confused with Hammer Spammer or Bowser's Hammer Slammer. 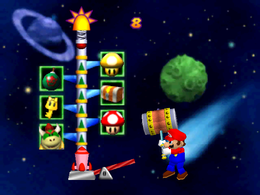 Hammer Slammer is an item minigame found in Space Land in Mario Party 2. The player has to hit the target spot hard enough with a hammer to bring the pointer up to the desired item. If the player hits the target too hard (resulting in the pointer bouncing back and picking the Baby Bowser item), does nothing at all throughout the game (resulting in the pointer falling off the pole), or lands the pointer on the Baby Bowser item, they get nothing. It is possible, however, to hit the target too hard and still get an item. Game Rules – "Use the might of the hammer to launch the shuttle to the Item you want." Advice – "If you raise the hammer too high, the shuttle will get bounced back by a spring. If it stops at Baby Bowser, you miss!" This page was last edited on May 29, 2018, at 11:21.